After more than three days of speculative frenzy, Thursday was mercifully a little bit quieter. Forest are searching for new owners following the death of former chairman Nigel Doughty earlier this year but both the Nottingham club and Leeds appear unaware of al-Hasawi’s intentions. The YEP say suggestions are that Nottingham Forest aren’t even in negotiations with a potential buyer. Hasawi has claimed that he has signed an agreement to purchase a club already. This would make it unlikely that either Leeds or Forest are the objects of Hasawi’s desire. Indeed, sources The Scratching Shed have spoken to question whether Al Hasawi even has the kind of funds required to buy clubs as large as Leeds or Forest. It seems Al Hasawi, who made his money in refrigeration and engineering, is one of those very rare ‘only fairly rich’ Arabic businessmen. With the revelation yesterday that Hasawi wanted to encourage the import of Kuwaiti players, Leeds fans could be forgiven for feeling a little relieved. I could speculate on his potential belle with impeccable pedigree in football, but it’s probably safer to wait until the end of June for his glorious unveiling at… wherever. This also makes the likelihood that he will be successful in poaching Neil Warnock a lot lower, so long as Leeds’ negotiations are completed relatively soon. The Chicago-based bid is still on the table and, having visited Leeds and the facilities exactly a week ago, would seem to be at an advanced stage of negotiation. The usual not-to-be-taken-overly-seriously rumours have it that simultaneously we will hear a positive announcement from the club at 13:00 tomorrow, and that the talks between the two parties have collapsed. Meanwhile, a Scandinavian agent who apparently knows Ken Bates has apparently revealed that Bates is looking at selling naming rights for the stadium only. Even though he, y’know, doesn’t own the stadium. Also, we may see a late bid from a billionaire called Randy Dicks. I hope no fans are finding all this credible? If so, please contact us, we have some fine antique Rolex’s… One Doncaster Rovers fan on Twitter did think he was the first person to notice the humour in the name ‘Randy Dicks’. For the record there are more than 50 Randy Dicks in America, and their greatest concentration is in Pennsylvania, closely followed by Michigan. I’m still not quite sure why I looked that up. Meanwhile the other interest that we know of, a group of businessmen based in the UK and Dubai, do not appear to have approached Leeds. Ken Bates has always said that potential buyers or investors must provide proof of identity, and proof of funds in a London bank before he’ll even negotiate his 72% stake, so with the Chicagoan negotiations already at an advanced stage, other suitors would need to offer fairly quickly to have a chance. Of course, even though I wouldn’t listen to rumours that it already has, it is possible that the Chicagoan negotiations will break down. Some potential bidders might not be willing to get into a bidding war but could consider approaching the club after the other bidders fail. There is reported to be real interest from three different parties so fans should remain calm whatever happens. And here’s another reason not to panic, for those wishing for new owners who might bring a new direction. Our last article mentioned reasons why there might be a cash-flow problem at Leeds. We couldn’t raise £400,000 for Joel Ward, and we only posted profits in the last few years because of the sale of our better players. We haven’t sold anybody yet this year, and if our hopes hinge solely on outgoings before in-comings, we look set to lose sought-after manager Neil Warnock. Equally, we have lost an average of 4,000 fans per home game this year. This means the club is probably at least £2m (before tax) worse off in terms of income than last year, when Leeds set a playing budget of £9.5m for the following year (down from around £11.5m the year before) and borrowed against two years of season ticket sales to redevelop the East Stand. At the time of Grayson’s sacking, our chairman claimed first-team spending had risen to as much as £13.5m, while the loss of match-day income together with a rumoured plummet in season ticket renewals can’t fail to have strained the books. To put it into perspective, judging by our chairman’s comments, Leeds overspent the playing budget by £4m last year while simultaneously losing at least £1m in match-day income. Sporadic individual boycotts of the club’s non-essential facilities must have an effect as well. Based on those figures, Leeds must be at least £5m worse off this year than the year before when we more or less broke even but still required a short-term loan of almost £1m from Ken Bates to tide us over. The disappointing season-ticket income this year which the East-Stand loan was secured against must really be straining the budget to breaking point. 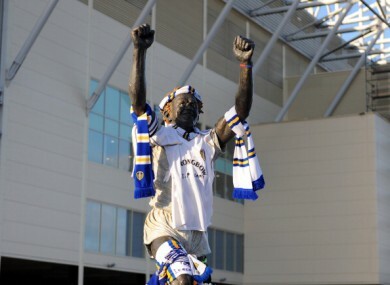 In my completely non-expert opinion, Leeds’ current owners need to come to an agreement for significant funding one way or another – a failure to do so hurts fans’ interests, it also hurts the interests of the owners. The confirmation of talks for “long-term investment” a few days ago was a “come and get me” call to potential investors. What shape that investment takes should not matter much to fans, so long as it allows adequate funding of what they all pay to see – the football team. So Thursday has come and gone without much fresh news, but with plenty to feel positive about.